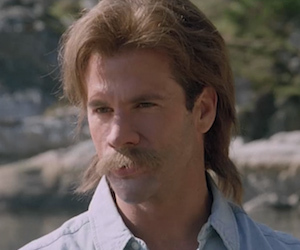 McKenna (Lamas) is a cop with a rockin’ mustache who happens to be taking a vacation on a remote lake, when baddies fleeing the law disrupt the party. In the ensuing battle, McKenna’s wife is shot and killed, and McKenna himself is shot in the face. While most people would have died from this grievous injury, his mighty mustache protects him from certain death. While in the hospital, his boss, Agent Jeffries, (Williams), convinces him to reconstruct his face after super-criminal Lyle Mason (also Lamas). McKenna reluctantly agrees, and now he’s undercover deeper than any cop has ever gone before him. Posing as Mason, McKenna has to navigate the criminal lifestyle without losing his integrity. This is going to be tough, because he can’t reveal his identity to former partner Turner (Chong), for fear of her safety, but she’s getting too close on her own. Will the truth of the mighty Lamas face be revealed? It’s “two Lamases - no waiting” in this silly, dumb AND stupid production. Truly this is not one of Lamas’ best outings. 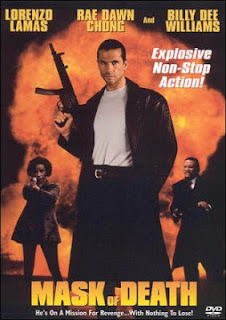 Perhaps he only did it to compete with Van Damme, who has played two Van Dammes in multiple movies. According to the tagline, “Danger Has A New Face”, so, it might as well be Lorenzo Lamas’ face. Or maybe it was a trial run for the crown jewel of television that he was involved in later in his career, Are You Hot? - and Mask of Death was just Lamas trying to prove that indeed he was hot whether he played a good guy with not just one, but several, stunt mustaches, or his classic baddie with oversized sunglasses and a leather coat. Billy Dee Williams’ role is minimal and he doesn’t really do that much, but he does mention something about Star Wars. Coincidence? Director Mitchell is also responsible for Thunderground (1989), Last To Surrender (1999), and UKM: Ultimate Killing Machine (2006), and his style is heavily Canadian, as his DTV productions scream “SHOT IN CANADA!” all over them. That’s not an insult, just an observation. Rae Dawn Chong is always nice to see, and her role gives her plenty of chances to get in on the action. But, as always, it’s all about the Lamas. That being said, we would suggest Bounty Tracker (1993), Bad Blood (1994) or Blood For Blood (1995) for better examples of Lamas action. In the end, Mask of Death may have the prerequisite shooting and stunts and such, but we found it strangely unsatisfying. See above for better examples of classic Lamas. Also check out a review by our buddy, DTVC! Damn look at that stash. Somewhere Wiford Brimley is smiling. Haha! It is the best part of the movie. He definitely gave Wilford a run for his money. I actually do think this film was one of Lamas's best efforts, he was very convincing in both roles. Lamas was solid as usual, but the movie around him was weak. I must second what 3guys said and compliment the stache! It reminds me of the guy from Boogie Nights! Haha! One of the greatest staches ever to be filmed.